Do your year-end office parties get out of hand? Want to avoid the same debacle as last year when Mark from sales had way too many drinks and would not leave Sally from accounts alone? Or what about the year before when you booked that fabulous luncheon venue in the middle of the country winelands but forgot to arrange transport home. Thanks to those 20 bottles of Merlot your boss insisted on purchasing, half the office had to leave their cars behind. Yes, we all have a little story of our own to tell about a year-end function that left someone red-faced the next day. With that said, wouldn’t you like to do something completely unique, healthy and fun this year? If you’re ready to make a change, we have the perfect year-end function venue for you at Acrobranch. 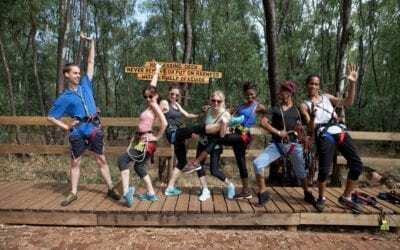 A global phenomenon that has caught the attention of all types of organisations throughout South Africa, Acrobranch offers South Africans of all ages a world-class ziplining adventure that they will be talking about for years to come. An eco-adventure built around tall old trees in lush forests – using cables, harnesses, helmets, gloves, a pulley system, platforms that feature loads of mid-air obstacles – ziplining is a unique and incredible way to celebrate the year’s successes, while offering employees a healthy day of fun as they soar through the air. It is exhilarating, re-energising, and, for some, it is even life-changing. Proud to have gained tremendous experience in hosting events for some of South Africa’s biggest brands, our function venues offer world-class facilities in the most breathtaking locations. As the fastest growing eco-adventure to hit the South African corporate scene, not only do we offer year-end function packages that include welcome drinks, catering, and a dedicated host who will capture your event on camera, but you also get to spend a few hours up in the air with your colleagues – laughing, bonding, and having the greatest year-end function of your life. Once your adventure is over, you can head down to one of our restaurants and enjoy the rest of your year-end celebrations. As the largest treetop canopy tour family in South Africa, we bring South Africans zip line adventure parks situated throughout South Africa. You can find an Acrobranch function venue in Honingnestkrans in Pretoria North, Pretoria East, Sunlawns Estate in Centurion, Melrose Park in Johannesburg, Linksfield in Johannesburg, Constantia Nek in Cape Town, and Timberlake Organic Village along the Garden Route. 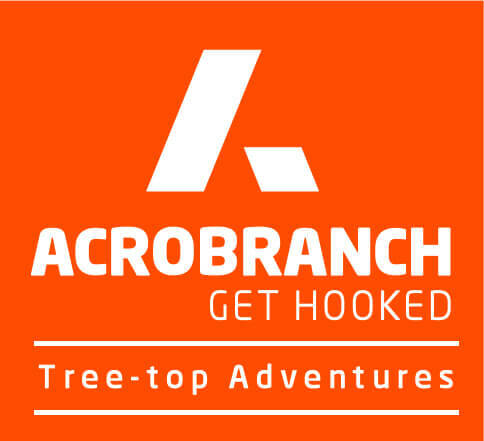 If you haven’t been to an Acrobranch Adventure Park near you, you’re in for the time of your life. No fancy lunch, dinner or office soirée can trump soaring through the treetops like a bird. To avoid disappointment, make your booking at an Acrobranch function venue near you today, and get ready to get hooked!